Ed picked up a cold a couple of days ago and is mostly over it, lucky me, I got it today. Shouldn't complain we managed to stay healthy on the trip. Now for a little trip summary. Ed and I are definitely not cruisers. We are use to put in long days site seeing with very little time to relax and that's the way we like it. Now, we would probably enjoy a cruise if the object was to relax and hang out with friends. 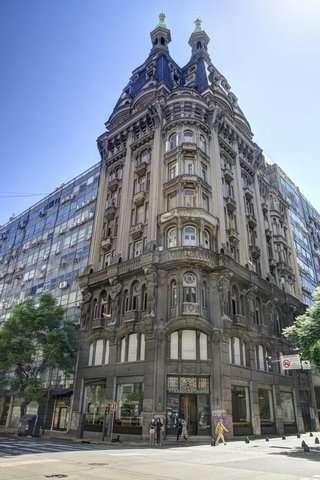 Santiago and Buenos Aires are both wonderful cities, neither were what I expected. It would have been easy to spend a few more days in each place. Iguazu Falls is amazing and I'm so glad that we added it onto the trip. If you are ever in Argentina make time and go to the falls. Argentinian ice cream is really, really good. Especially limon and anas (lemon and pineapple). 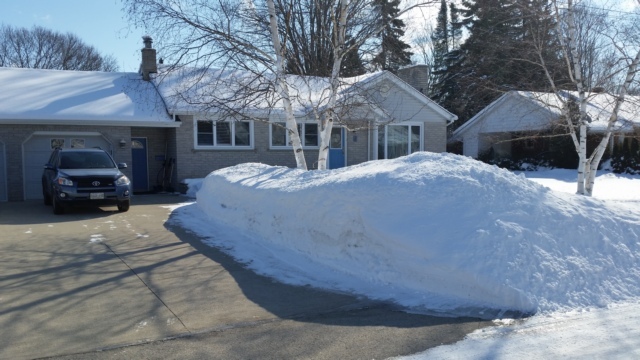 Should be a fairly easy day --- up at 6am, have breakfast at 6:30am, leave for the airport at 7am, get on the airplane and depart at 9:40am, arrive in Toronto at 6:45pm, get picked up by 7:45pm, go to my mother's house and switch vehicles and arrive home by 11pm. Ed checked his e-mail when he got up this morning and there was a message from Air Canada --- our flight was delayed by an hour and a half as it left Toronto late. That's not too bad, so at 11:30am the plane is load and we're ready to go and the captain announces that the flight plan is being changed due to bad weather over Brazil but it shouldn't take long. Finally at 1pm we pull away from the terminal and start the flight home. We arrive in Toronto at 10:50pm, 4 hours later than expected. It meant we arrived at home at 3am but a lot of people with connecting flights were getting to spend a night in a hotel. 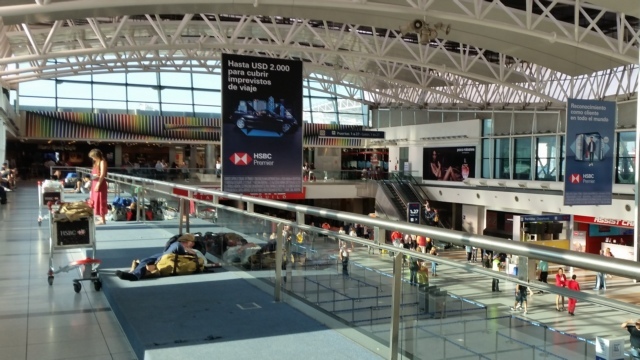 Buenos Aires Ezeiza International Airport was very nice. There are raised platforms on the edge of walkways. I'm not sure what the platforms purpose are but a lot of people were using them as spots to sleep. 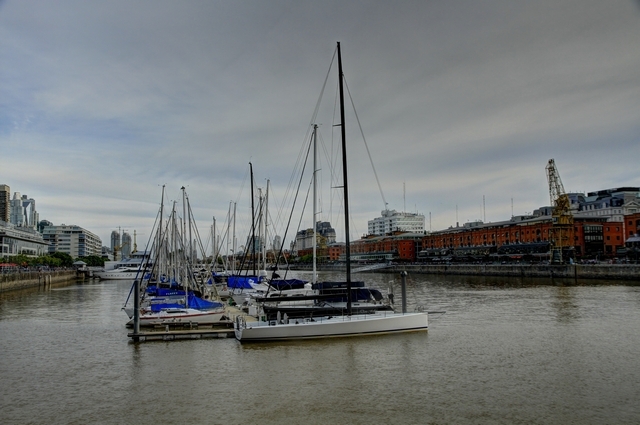 This afternoon we fly back to Buenos Aires so we had time to explore more of town. The town was much busier today as it wasn't a holiday (Monday and Tuesday were holidays). I liked the look of this house. I noticed that most houses had a tower with a water tank. 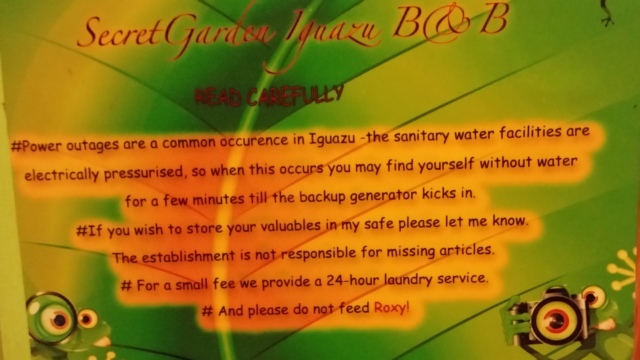 When I questioned Ed about it, he said haven't you read the sign on the wall in our room. I'd put a tank on my house too! Lots of small motorbikes in town but not a lot helmets. The main roads are paved but lesser roads are hunks of rock with grass growing in it. No problem finding this house on a foggy day. Walking out to the plane. We ended up in row 28 ... only 29 rows in this plane but no one sat beside me so that was good. 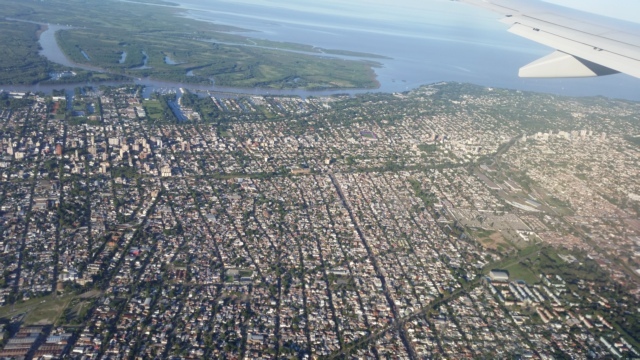 Looking down on Buenos Aires just before we landed. I found this statement on the internet which I found interesting. "Now, the Niagara Falls are undoubtedly the world's most famous, the Victoria Falls are surely the world's largest, but the Iguazú Falls are unhesitatingly the most impressive and exquisite! ... The waterfall system consists of 275 falls along 2.7 km (1.67 miles) of the Iguazú River." 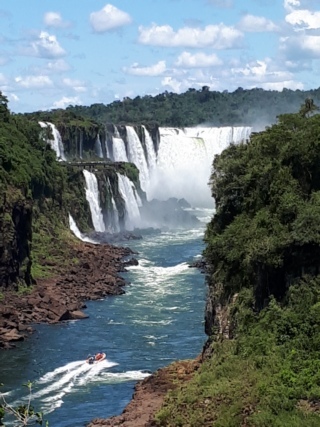 I have to agree that there's a definite WOW factor with Iguazu Falls. In fact I consider this to be the highlight of our trip --- the penguins were a close 2nd. The falls can be viewed from the Argentina side or the Brazilian side. We opted to just view the falls from the Argentina side. A photo of the map gives you a better idea of the overall size of the falls. The blue dotted line is the lower trail, pink dotted line is the upper trail and the goldish line at the top of the photo is the Devil's Throat trail. The easiest way to get to the Devil's throat trail is by train. The Devil's Throat trail puts you level with the falls. Today (and probably most days) there was a lot of mist, which given the heat was most welcoming. I got a little damp but it didn't take long before I was dry. 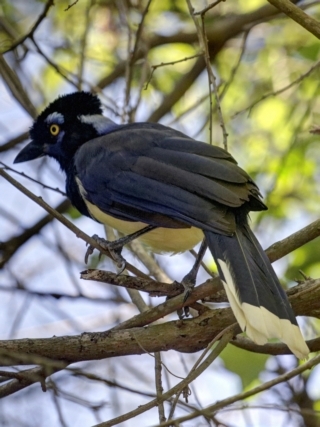 The Plush Crested Jay hung around in a couple of spots along the trail. There were a lot of people at the falls today --- and this was still reasonably early in the day. The majority of the trail system is made up of raised metal walk ways. This is why the trail is a raised metal walk way. There is an egret in the photo but it's very tiny. The falls change depending on the rain. In 2006 Iguazu Falls experienced a drought that dried up many of the falls and left some as a mere trickle. You can do the "jungle ride" and boat cruise. The jungle ride drives down some back roads to the boat launch. The boat takes you out on the river and gets everyone wet by going under the falls. We went out for dinner with Annie and Richard this evening and chose a restaurant close to the hotel. After we were seated the waiter came over and recited the menu to us --- at this point we began to wonder what we had gotten ourselves into. The guys wanted "meat" so ended up with a Parrilla Completa --- a full dinner of different grilled meats plus appetizers, salad, french fries and desert. Boy was it a lot of food --- appetizers consisted of heated cheese, chicken hearts, blood sausage and regular sausage. The main course was at least 4 different cuts of beef all grilled, Ed choose lemon ice cream for desert (Argentina's ice cream is absolutely amazing). It was a lot more food then the guys could eat. After we ordered the food I realized that we didn't know if the restaurant accepted credit cards or what type if they did. Oooops they only accepted Visa so good thing the hotel was close as Ed had to go back to the room to get the Visa card. The restaurant did have entertainment. Don't know who the guy was that was singing but he did have a wonderful voice. Annie mentioned to the owner that Richard was a singer and much to Richard's dismay he was convinced to sing. He decided to sing When I'm 64 by the Beetles because he turned 64 during their trip. Everyone in the restaurant enjoyed Richard's song --- the hostess even video taped it! By time we left the restaurant I think we were everyone's friends. There was lots of hand shaking and "chau"s when we left. 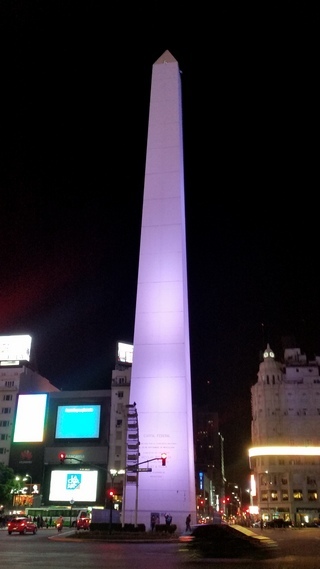 We had now experienced what Cerri (our guide in Buenos Aires) had tried to show us. It's raining in Buenos Aires this morning but that's Ok as we are flying to Puerto Iguazu today. 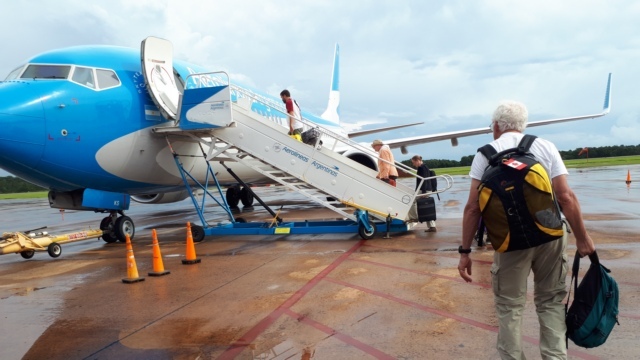 A short taxi ride gets us to Jorge Newbery International Airport which handles domestic flights & international routes to and from Uruguay, Brazil, Chile and Paraguay. We are pleasantly surprised that we have been assigned seats in the emergency exit row ---- lots of leg room, plus the plane is only 2/3 full. An hour and 50 minutes later we arrive at Puerto Iguazu. We have booked a room at a B&B called the Secret Garden. 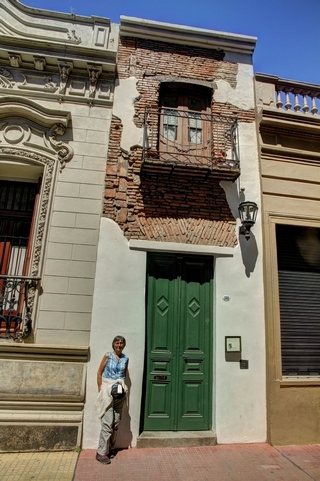 Unfortunately the owner (John, who was a professional photographer) had a stroke a year ago and is still convalescing in Buenos Aires. The B&B is currently being managed by a young man named Esteban (he also helps out with the other hotels his family owns). Esteban's younger brother is the driver, he's learning English and hoping to manage hotels as well. He picked up and delivered us to the airport and to Iguazu Falls. The patio was a wonderful spot to enjoy breakfast and the 7pm cocktail. Our room a short walk through the jungle garden at the end of the walkway. 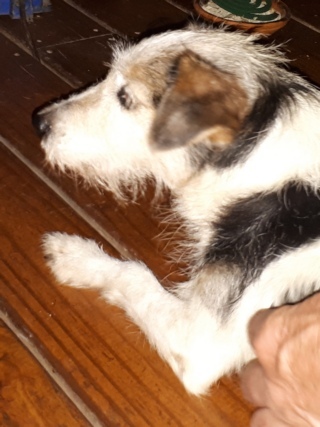 I can't forget Roxy. I think she actually runs the place. With map I hand we set off to explore the town. Puerto iguazu is bordered by 2 rivers, Rio Iguazu and Rio Parana. 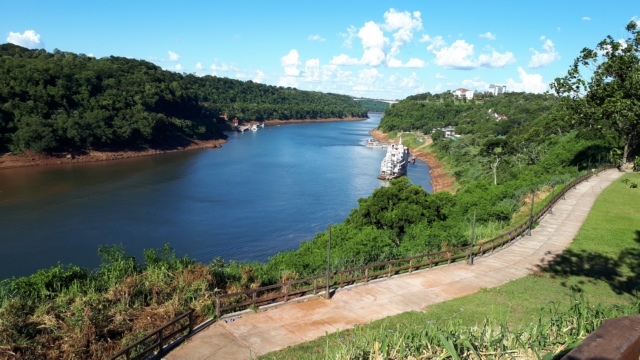 What makes it really interesting is that Brazil is on the other side of Rio iguazu and Paraguay is on the other side of Rio Parana. 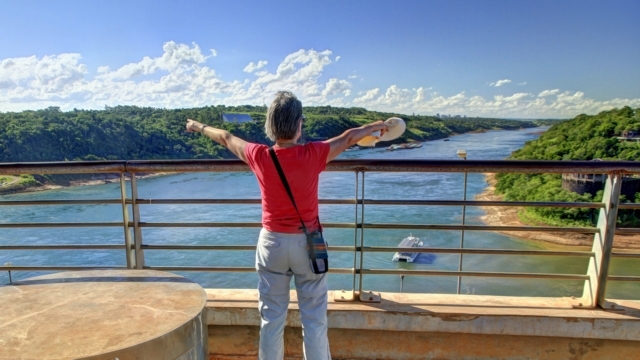 So here I am standing in Argentina and pointing at Paraguay and Brazil. The only way to get a photo of the flags without strangers in it, was for me to take a turn and have my picture taken by the flags. The globe was interesting piece of art we saw as we walked along the road. It indicated mileages to different places in the world. There were a number of beautiful murals in town. 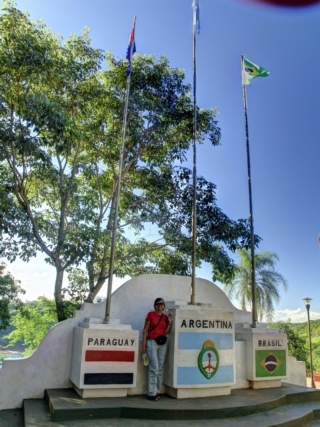 The meeting of Rios Iguazu and Parana. A look down Rio Iguazu. John, the owner, had a tradition of cocktail hour for the B&B guests. Esteban is continuing this tradition. We meet a couple from England (Annie and Richard) and a Welsh fellow who is currently living in the US. Ed and I walked down the road to a restaurant and had a lovely dinner with Annie and Richard. Before we left home we had booked a private 7 hour walking tour with an ex pat. In our case, the guide, Ceri (the Welsh spelling of Kerry) is a Canadian who has lived in Buenos Aires for over ten years. In my opinion he was a good fit for us as he understood the Canadian way of thinking but as he has embraced the Argentinian way of life he was able to show and explain that. The tour was a great combination of seeing the sights, learning historic and current affairs and insight into the people and their way of life. 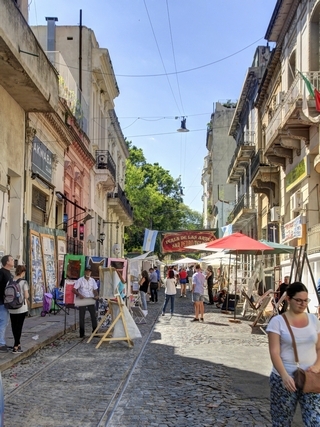 We started our day by visiting the Sunday market in San Telmo. Lots of vendors and even more shoppers. There is a lot of graffiti and tagging but also what I consider art. These two men are rappers. Ed's idea of a candy store. Our guide also enjoys photography and took us to his favorite antique camera store. 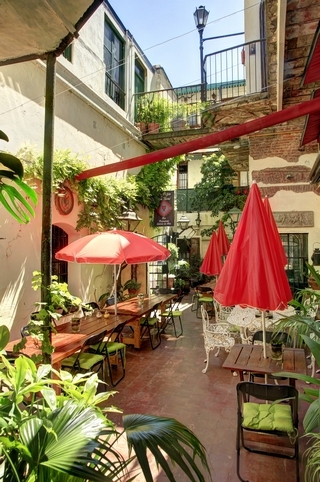 As in every old city, there is the narrowest building and there are many beautiful courtyards tucked in behind the streets. The courtyards are home to apartments and restaurants. 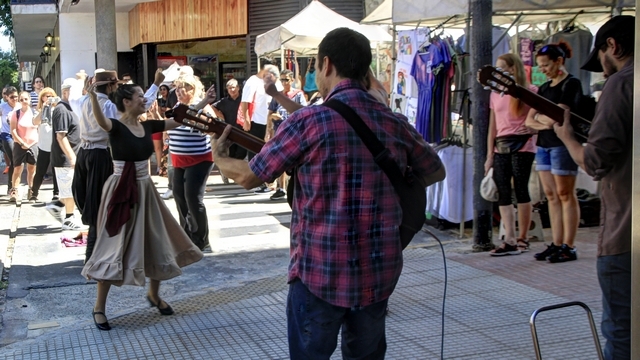 Argentinan folk dancers dancing with some locals on the street corner. This beautiful old building has newer buildings on either side of it. Notice all of air conditioners in the newer buildings. More clock towers and monuments. The city is full of them. There is always a line up at Gran Cafe Tortoni which was opened in 1858. Our guide knows the staff at the cafe, so we were able to go in and take a few photos. This is the writers room where important writers of the day hung out. 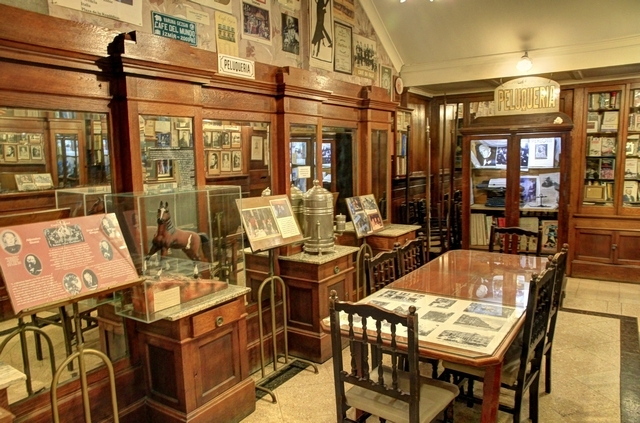 In the 1920s the cafe was frequented by a group of painters, writers, journalists and musicians who did not spend much, but gave the café a bit of luster and fame. This back room is set up as a reminder of those days. 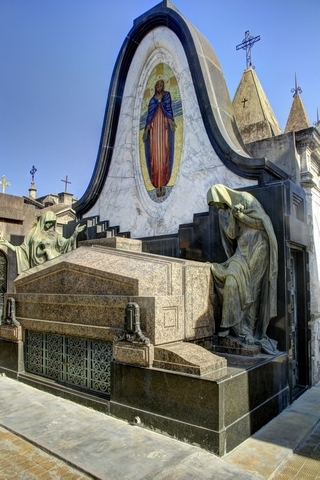 The Recoleta cemetary is New Orleans cemetaries on steroids. There were a lot of amazing tombs there. Our guide was very knowledgeable on the cemetary as he is working on a photo book. Just an interesting photo .... the reflection of the old in the new. As it was Sunday lots of family and people with their dogs were out enjoying all the green spaces in the city. 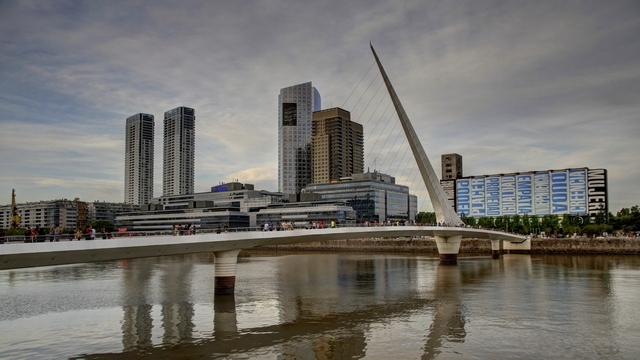 After we left our guide we walked towards the waterfront and the Puente de la Mujer (women's bridge). The bridge is a rotating footbridge. It is of the cantilever spar cable-stayed bridge type and is also a swing bridge. The cruise is over and it's time to get off the ship. In some ways it's sad but in other ways I'm really happy. 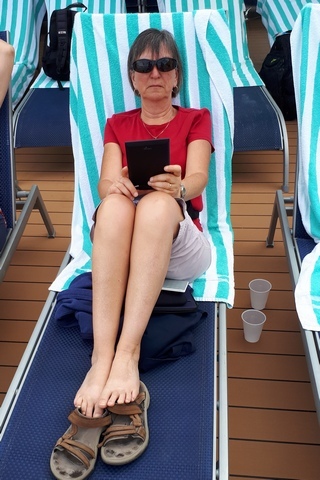 We saw a lot of beautiful sites, missed out on some (Falkland Islands), ate way too much food, saw some good shows, met some interesting people but we spent more time at sea then I liked. Now it's time to move onto the next adventure. Our first view of Buenos Aires. 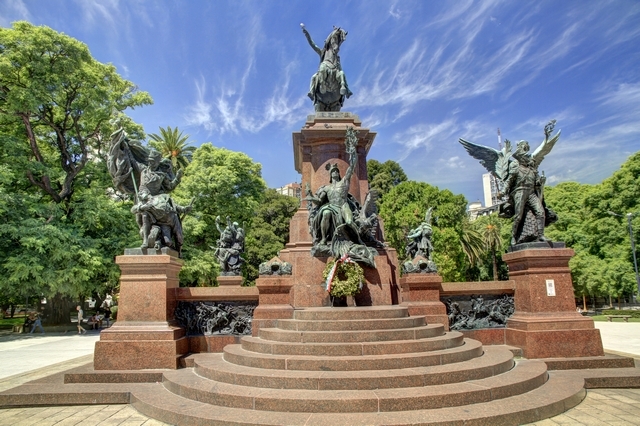 "The monument itself was erected in 1936 to commemorate the fourth centenary of the first foundation of Buenos Aires by Pedro de Mendoza in 1536, and it marks the spot where the Argentine national flag was raised in the city for the first time. 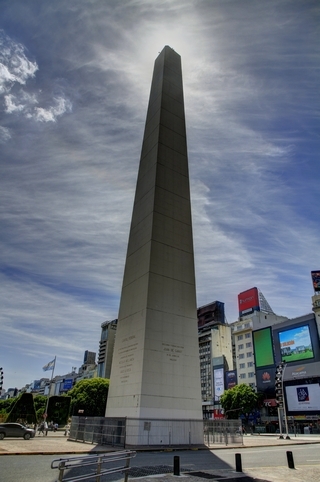 The obelisk is 67.5 metres in height." It's great to have unlimited free internet again. We needed to get some Argentinian Pesos and as the banks were closed (it's a Saturday) the fellow at the front desk suggested a money exchange in "the mall". This is the inside of the mall. Fresco like ceiling and the interior walls were made to look like exterior walls of old buildings. We found a pretty park in our wanderings where Ed found his first Argentinian geocache. 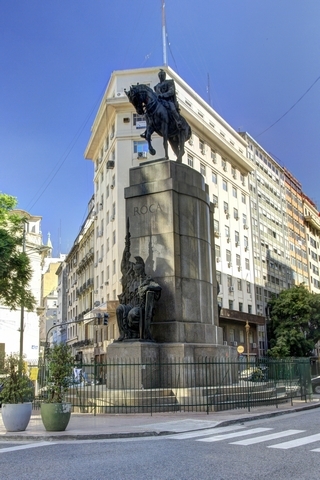 Monument of General San Martin in Plaza San Martin. 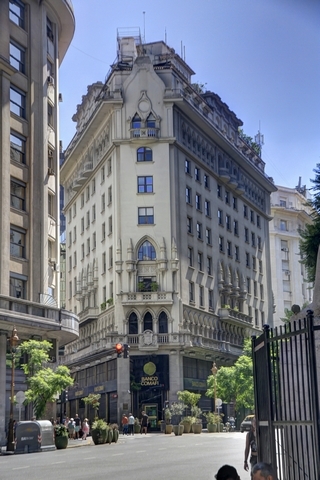 Some of the streets in Buenos Aires are very wide like 9 de Julio (the road the obelisk is on), others are very skinny with tall buildings down both sides. One of thousands of beautiful old (I think) buildings. Soldiers we found walking to the "pink house", Argentine's Government house. 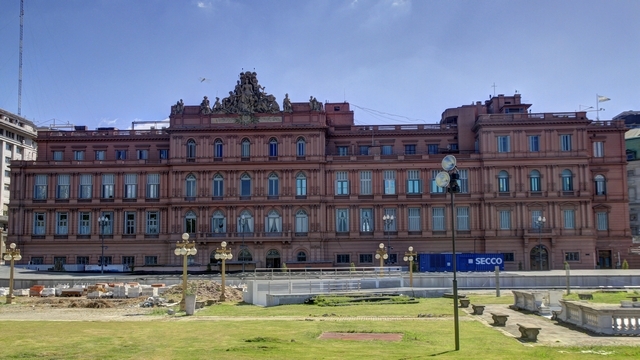 The front of the Pink House, Argentine's Government house. The lawn in front of the building appears to under construction as it much of the area. 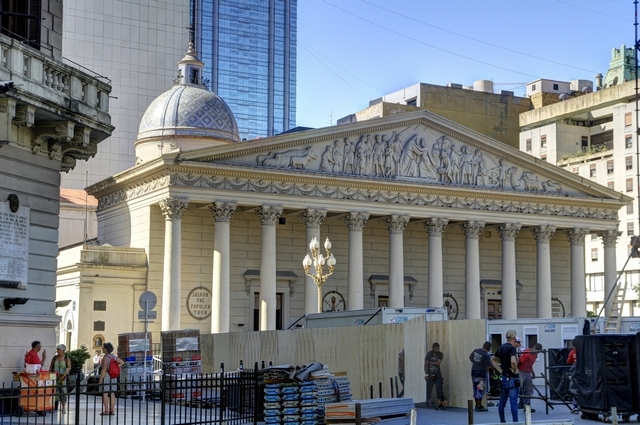 Buenos Aires Cathedral outside with construction. Buenos Aires Cathedral inside. It is currently being restored. 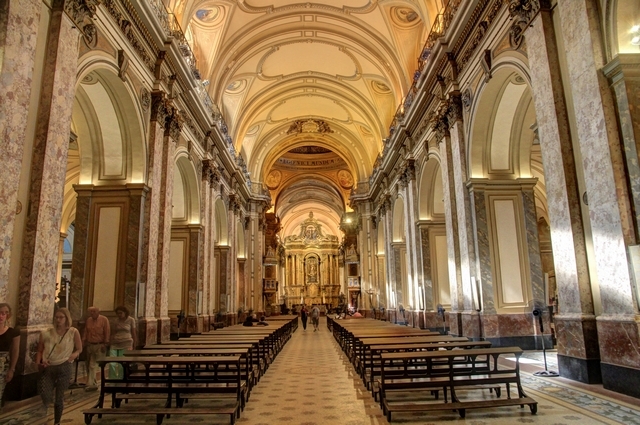 Saint Ignatius is the oldest church preserved in Buenos Aires. The first building, which was made of adobe, was built by the Society of Jesus in 1675. 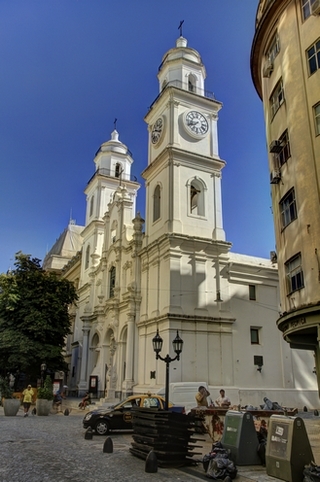 The southern tower and the present facade were built in 1686, and the rest of the Church construction started in 1712. Today's church was completed in 1722 and consecrated in 1734. The photo of the statue will always be a reminder for Ed and myself to pay attention to your surroundings when you are travelling. Ed had just finished taking this photo when the two of us stopped to look at a map. Next thing we knew we had been hit with liquid and a lady was offering us Kleenex. Out of know where a man came and started wiping Ed's pants. We may have not been paying attention to what was going on around us but we did know to carry the backpack on the front, and wallets in front pockets (the wallets didn't have much in them). Ed said he felt the guy pushing at his pocket but to no avail, it wasn't coming out and Ed was ready to grab the guys hand. At this point the pickpockets left hopping into a taxi. Just before she left the woman said --- it's just water. Well it was dirty water but it did wash out. We asked at the front desk for restaurant suggestions and the fellow asked if we liked meat. 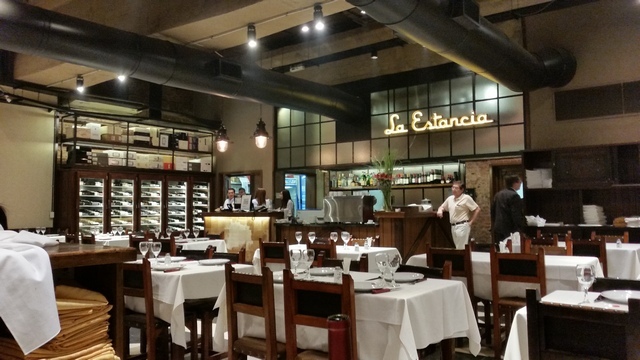 We answered yes, so the fellow at the desk suggested La Estancia. When we arrived it wasn't busy, when we left every table was full. A large portion of the "meat" is cooked over coals from a wood fire. There is a fire box that has a rip roaring fire in it, and when coals are needed for cooking they are removed from the fire. Your meat arrives at the table on a metal tray that is sitting over a dish of hot coals. The cruise ship pulled in the Montevideo Harbour this sunny, warm morning. Old boats are piling up in the harbour due to a problem with the contract between the city and the company disposing of the boats according to a tour guide. We started the day with a bus tour around Montevideo ---- a couple of the highlights were Ed finding a geocache and seeing parakeets. We left the tour at the main square (the last stop before returning to the ship) and enjoyed a walk in the “old town” on the way back to the pier. Oh, it was sunny and warm (28C) all day. 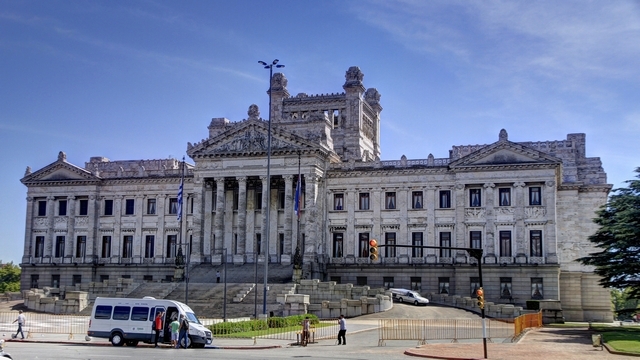 Palacio Legislativo, a government building. I miss not having unlimited internet so I can google while I write the blog. 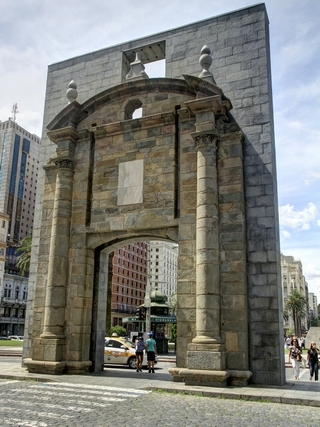 One of hundreds of statues in Montevideo. One of the parakeets we saw in a park. 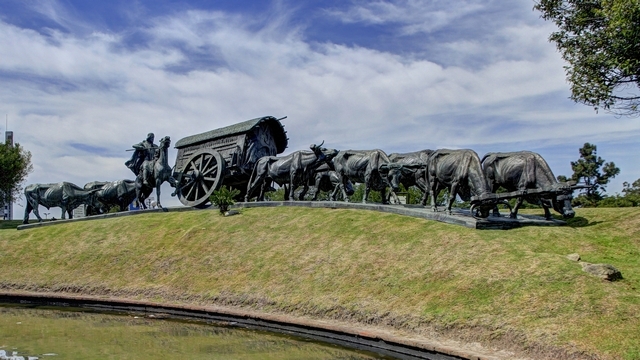 The bus drove us through several of the many parks in Montevideo. These buildings fill one corner of the main square. The tall building is offices and apartments. The tall building butts at a 90 degree angle to another building which is attached to 3 more buildings. This building is the president’s office. We think the men in the colourful uniforms have something to do with the president’s office and we think this is one of the gates to the old city. Really missing google. One of the pedestrian streets. The old cathedral, out and in. The cathedral wasn't all that special on the outside but the interior of the building was amazing. Some of the thousands of shipping containers in the dockyards. The Montevideo skyline as the ship is leaving the harbour. I have to admit that a sunny, warm day at sea is a lot nicer than a cold, windy, wet day at sea. 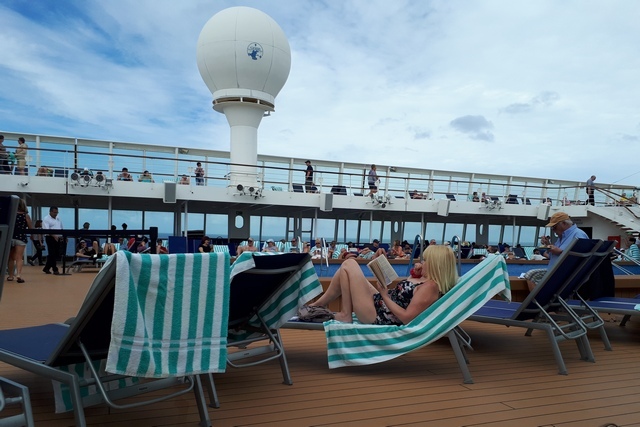 Ed and I read our books and listened to the cruise band while we enjoyed the pool side deck and the sun and some warm weather. Lots of people were out enjoying the weather as well. These photos are a little different than the ones from a previous sea day. Yeah!!! We get to go off the ship today. Our excursion today is Estancia Experience, Punta Loma and & EcoCentro. This interprets to we visit a sheep farm, stop to see Sea Lions at a sheltered harbour and visit a museum with information on whales and other sea life in the local area. 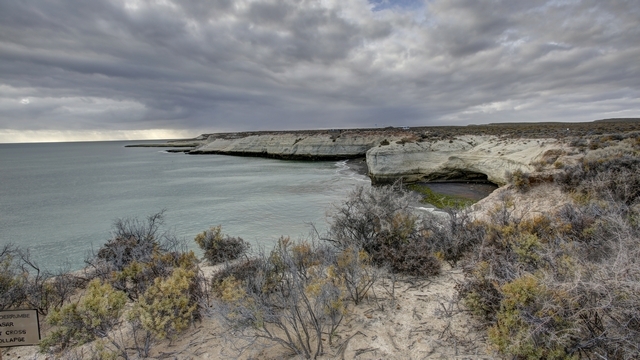 Puerto Madryn was originally settled by people from Wales and there is still a large community of Welsh. There is also a German community that was settled in the late 1800’s. Our guide was an interesting fellow. He said his father’s side of the family are direct descendants from the original Welsh settlers and his mother’s family are direct descendants from the original German settlers. Since we landed at low tide our guide said we should go see the sea lions first. Low tide means bigger beach which means more sea lions are sunning on the beach. The shoreline near the sea lions cove. Leaving the sea lions we drive through the desert to the estancia. Along the way we saw a herd of wild Guanaco. Between our guide and the farm owner (he only spoke Spanish) we heard about life on the estancia. We also met a couple of gauchos (cowboys). One of the gauchos sheared a Ram. One thing I found interesting is that the gaucho was able to shear the sheep keeping most of the wool in one piece. The ram (the one with the horns) is the one that’s getting shorn. I got to help hold the sheep down …. Barely touching it, kept it on the ground. The gaucho sheering the Ram. After a tasty snack and a look around the gift shop we were off to our last stop, the Eco Centre. The Eco centre is in a very pretty location. We opted to be let off the bus in the downtown area. On the way back to the ship we stopped at the end of the pier to watch a couple of penguins “fishing”. It’s amazing how fast they can swim. 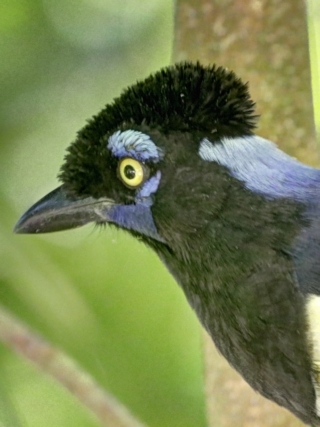 This bird was also fishing and boy could he swim fast. 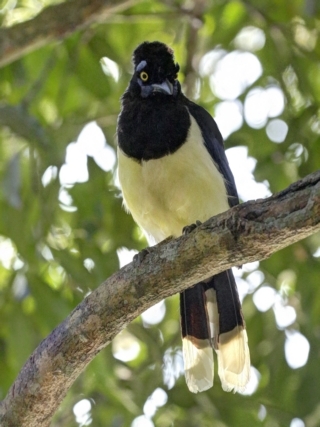 At one point the penguins chased the bird away but he came back. The dock area had a fair bit of wildlife. There were lots of birds including this tern. A view of the pier and Puerto Madryn as the ship pulls out.